Deep convection has been staying persistent in the north central Gulf of Mexico since yesterday and it looks as though a surface low has formed a couple of hundred miles south of Pensacola,FL. A Hurricane Hunter recon is scheduled to visit the area early this afternoon and we will know if we have a depression for sure. Forecast models are consistent on building a high to the north, then northeast of this system. It will take this feature generally westward for a landfall by Tuesday on the central to upper Texas coast. Last edited by Caribbean Traveler on Sun Aug 03, 2008 6:18 pm, edited 2 times in total. The first visible satellite image in now available. The surface low is on the edge of the deep convection on the northeast side of the cluster. (A little east of the previous estimate.) With this being the case, the low is probably weak at this time. Northeasterly winds aloft are keeping the moist unstable air southwest of the center, so the system may struggle at first. Conditions should become more favorable for development as it moves mostly west, then maybe west-northwest by later Monday. The center of circulation of the low is about 155 miles almost due south of Mobile, Alabama. The center remains barely under the deep convection. the strongest winds will be found on the south side of the circulation over the central Gulf, or well west of the center if the Hurricane Hunters actually fly that far west. An earlier Quickscat pass nearly had a closed circulation. We think that their is enough of a circuation to call this a depression at this point. The latest forecasts have not changed much and move this system west then more northwest before landfall Tuesday near Galveson/Houston. Keep in mind its not that wise to just key on the exact forecast landfall center at this point, as with a weak tropical system, effects can be far from the center. 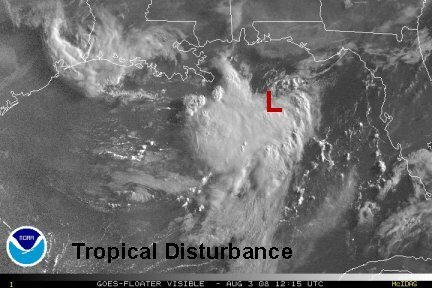 NHC officially named the system T.D. 5 at 4 pm cdt. The hurricane Hunters found a pressure 0f 1007 mb. It was interesting to note that the public never saw the vortex message until well after the advisory time. It would have been nice to see that info when it was coming in! At this point we agree with NHC's analysis that it will most likely come in as a tropical storm. T.D. 5 will probably not have enough time to strengthen before making landfall to make hurricane strength. The forecasts haven't changed at all. NHC's track takes the storm in Tuesday Morning on the upper Texas coast as we we're saying earlier today. Edouard is slowly moving west at 5 mph and is centered about 370 miles east-southeast of Galveston,Texas. Tropical storm Edouard has slowed its strengthening phase. The last Hurricane Hunter recon still measured a pressure of 1002 mb. The center of circulation is now between thunderstorm clusters. The deepest convection is southwest of the center of circulation. Strengthening will depend on the deep convection wrapping back around the center of circulation. The water vapor imagery shows dry air droppping from the north to west of Edouard. If dry air can be entrained into the circulation, it would also diminish additional strengthening. The latest advisory has Edouard at maximum sustained winds of 50 mph. At this point gusts may be approaching 50 in the cluster southwest of the center. Near the center winds are probably no more than 25-30 mph. NHC is doing this for the sake of continuity. No sense dropping the winds when they will probaly pick up with the next convection burst. The forecast track is essentially unchanged. Landfall should be near Galveston Tuesday morning. Keep in mind do not solely depend on the exact landfalling point with a tropical storm. Tropical storm effects can be quite far from the circulation center. 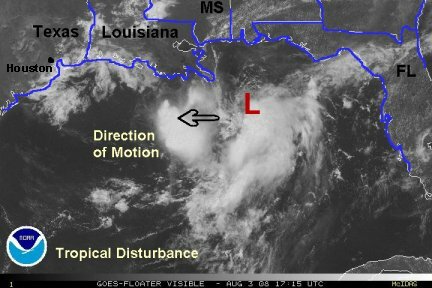 Finish making preparations on the mid to upper Texas coast to southwestern Louisiana ASAP Monday. After losing convection and becoming very disorganized late last night, Edouard is now making a run at strengthening. Edouard is now about 285 miles east-southeast of Galveston, Texas and still heading west at about 8 mph. Flight level winds probably aren't 50 mph sustained as discussed in the prevoius advisory, but could be at that level again soon as a deep convectioin burst in now under way. It looks as through the convection will wrap around the center this time, allowing for significant strengthening. 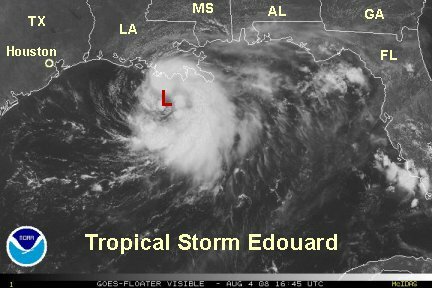 Edouard has about 24 more hours over water where this can occur. No additional Hurricane Hunter recon data is available. Were not sure if the next one is at the 18 Z time or if the date will be released again later. The highest surge will be near and to the north of where the center crosses land tomorrow morning. Expect a 2-4 foot water rise with higher waves. This could significantly change if Edouard gains strength. NHC just release there 10 cdt advisory and they actually dropped the winds to 45 mph. They have the center 265 east-southeast of Galveston, which seems a touch too far west. 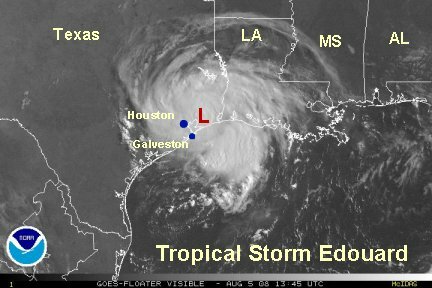 At 12:35 pm cdt, Edouard was centered 255 miles east-southeast of Galvestion, TX. It appears to has picked up a little speed and is moving west at about 10 mph. Top sustained winds are probably up to about 50 mph at this point. Once again, no Hurricane Hunter recon data is available. No doubt NHC is seeing it. The conditions are going down hill rapidly today with squalls developing at the mouth of the Mississippi river westward to the central Louisiana coast. Water rise will be picking up today on the Louisiana coast and by this evening toward the upper Texas coast. Satellite imagery shows that the deep convection is about to wrap around the low. This will allow for a strengthening period as it approaches the upper Texas and western Louisiana coast tonight. Remember near where the center and north of the center crosses land will be the higher storm tide area. This would equate to roughly the Galveston,TX eastward to Marsh Island, LA. 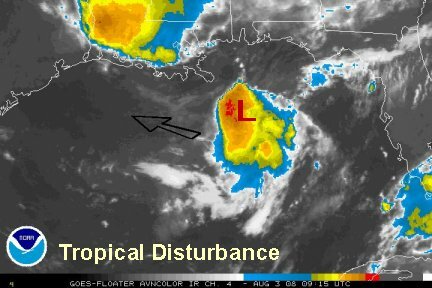 Finish making preparations on the mid to upper Texas coast to southwestern Louisiana ASAP, weather diminishing rapidly on the central Louisiana coast now. Edouard has become much better organized today and only the western part of the circulation is open. Edouard's storm tide will be the highest from near Galveston northward to Cameron and Vermilion parishes of Louisiana. A surge of 2-4 feet plus waves on top of that are expected. The storm tide may be higher if Edouard strengthens through tonight. Heavy rainfall in excess of 5" is also possible. Preparations should be rushed to completion on the Upper Texas and in the south western parishes of Louisiana. Unfortunately the high resolution satellite imagery has been lost for some reason for a few hours. We still have other satellite imagery, recon data and radar imagery. The radar imagery is now becoming more important now that the center of circulation is discernible. It looks like Edouard is getting better organized still and sometimes it takes a little time for that to translate to stronger winds. We think that will happen tonight. The last recon measured a pressure drop to to 999 mb. That is not a big pressure drop, but a sign that things are starting to happen. All preparations need to be finished by now. Do not get caught on the road after dark. Weather conditions will rapidly go down hill in the southwestern parishes of Louisiana and on the upper Texas coast overnight into tomorrow morning. The forecast guidance has shifted ever so slightly farther north of Galveston. 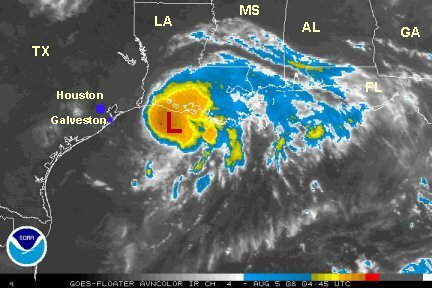 The highest storm tide will still be the upper Texas coast and southwestern coast of Louisiana. Landfall still looks to be late morning, maybe midday. Edouard will make landfall by early afternoon near or just to the north of Galveston,TX. Last advisory had top sustained winds of 60 mph. Winds are probably less than that, but should be close soon, if the convection near the center continues to develop. Rain from Edouard has made it well inland into southern Louisiana. 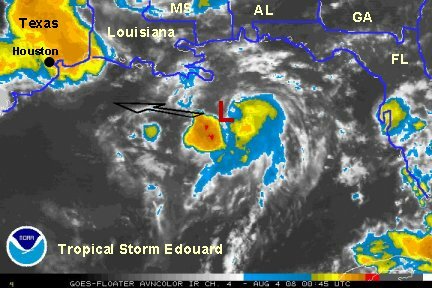 Edouard had been fighting dry air that was pulled southward from Louisiana into the western Gulf. Satellite imagery shows that a deep convective burst has now wrapped around the western side. Radar imagery from Lake Charles shows that the center of the low is a vorticy on the western part of the convective burst. It is interesting to note that a larger circulation is developing which may try to become the formation of an eye wall. With this being the case, it finally looks like Edouard is making an attempt at strengthening just before landfall. NHC advisory just came in. No change to wind. Center 120 miles east of Galvestion, TX. Edouard is centered 70 miles northeast of Galveston and is moving west-northwest at 15 mph. In addition to the hurricane watches being discontinued, the tropical storm warnings have been cut back to Cameron, LA to San Luis Pass, TX. All warning will likely be dropped later today. The heaviest rain is on the east side of Houston in a band about 20 miles wide. A smaller band is over the city oriented more or less north-south toward Galveston. Flash flooding can be expected with the heavier band. Doppler radar has estimated 4"+ north of high Island. Local amounts of 5"+ can be expected. The top sustained winds are officially at 60 mph, but we feel they are probably a little lower with gusts near 60 mph with the squalls well out over the gulf. Edouard is a weakening tropical storm centered a little northwest of the Houston metro area. It is moving northwest heading east of Bryan to Waco over the next 24 hours. Beneficial rainfall is falling as far south as San Antonio. A heavy rain band continues over Houston at this hour. This is the last update on Edouard. The forecast models on Edouard did very well until the last part of the forecast track. For two days or more, the models forecasted a landfall near Galveston, TX. The official landfall point was just north of high Island. Our forecast stated near or just north of Galveston. Overall about 20 miles farther north than expected. Why did this occur? Well, starting Sunday, the water vapor imagery showed dry air intruding from Louisiana into the western Gulf. This dry air disturbed the circulation development. 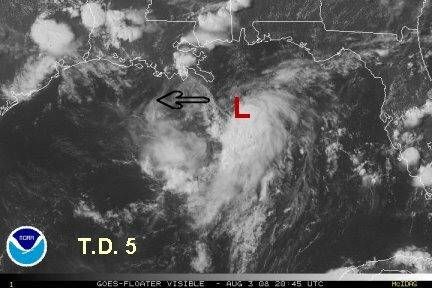 Only until last night did the deep convection finally wrap around the center and allow for development. During this process though, a vorticity formed in the western part of a large circulation. This vorticity became the new rotation center which was farther west. Also, a slight jog to the northwest allowed the center to touch land several hours earlier due to the shape of the coastline. If it weren't for the jog north landfall would have occurred later during the morning. 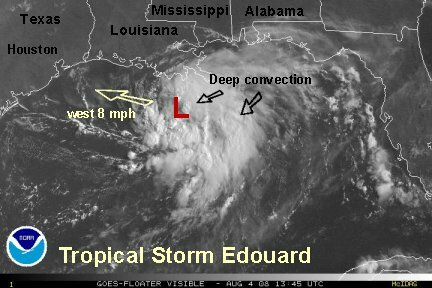 Overall, a complex interaction of Edouard with the surrounding environmental conditions. 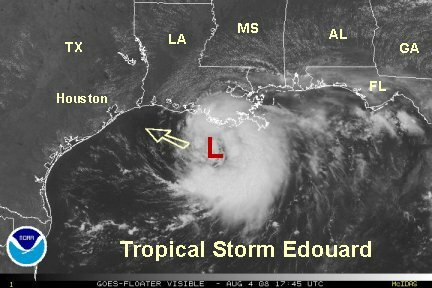 Edouard many have done more good than harm, bringing needed rain to a dry location.